beta.drupal.org is ready to QA! – All Markup News. Home » Drupal News » beta.drupal.org is ready to QA! – All Markup News. The drupal.org redesign team is looking for people to help perform Quality Assurance (QA) testing of beta.drupal.org. We have been working on redesigning Drupal.org and are nearing the first launch. Some details still need work, and we need your help to find and fix them. Major revisions will likely not be included in this first launch; however, drupal.org is a community effort that is continually evolving. We want your feedback, and we want you to help continue to make our home better. There are opportunities for people of all skills to help us identify or fix problems. Bill O’Connor (csevb10) and Neil Drumm (drumm) are leading the QA effort and can be reached in #drupal-redesign on IRC or in the redesign issue queue. We need help with functional testing and cross-browser/platform theme testing. We will be periodically pushing changes, so the community will see progress on resolving issues. If you discover a problem outside of the issue you’re working on, check for an existing issue before filing a new QA issue. Instructions for filing a new issue are listed under Task 3 below. Ensure that it behaves logically: if what it does technically works, but it doesn’t make sense, it may need to be fixed. Steps to recreate – i.e., “what do we need to do in order to see the problem in action”. Please be detailed enough to easily replicate the problem. Attach a screenshot (if possible) to show the error in action. See this example. Add the tag ‘drupal.org redesign qa code’, in addition to the existing tags. Change the status to “needs work”. If you don’t find any problems on a QA issue, mark it as ‘reviewed & tested by the community’ with a comment with any other details. The redesign team will review and marked fixed if it’s ready. Review https://infrastructure.drupal.org/drupal.org-style-guide to get a sense for what the designs should embody. We are not testing to match these exactly, but it is a good reference for how the final product should look. Screenshot of the theming issue. See this example. 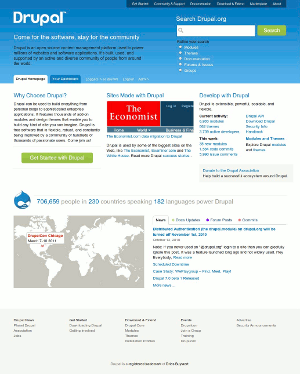 Add the tag ‘drupal.org redesign qa theme’, in addition to the existing tags. Go to The Redesign project. Tags = ‘drupal.org redesign’, ‘drupal.org redesign qa’ and either ‘drupal.org redesign qa theme’ or ‘drupal.org redesign qa code’. Please mark as appropriate based on Task 1 or Task 2 above. Feedback on the drupal.org redesign outside the functionality and theme is welcome. We request that any feedback be respectful and constructive, in accordance with the Drupal community of conduct, and that it be posted in the Redesign issue queue so that it can be assigned and acted on as appropriate. Read more on how to use the issue queue. The redesign team is reviewing and prioritizing all feedback that it receives. Issues deemed critical and urgent will be taken care of prior to the launch of the redesign, but other improvements will be made afterward. The redesign team will do their best to strike a balance between the issues that can be addressed prior to launch and those that represent more long-term improvements.